These are the rules. All new players please read before posting. As long as you follow these rules and use your common sense, this community will remain safe and fun for everyone. Need help with using the forum? Not sure how something works? Or you just need more information? Post a topic here and our staff will try to help you with your problem asap. Also suggestions and ideas are located here. New and don't know where to start? Why not drop by and say a friendly hello to our members. Leaving? Let us know by posting a thread up! Want to talk and share something general regarding pokemon franchise? Enjoy watching pokemon anime tv series? Or enjoy reading the mange? Here you can take part in all the various ongoing discussions about the anime. Have a game you made by yourself or enjoy playing other fan-made games? - All trivia related to pokemon franchise - Pokemon Trading Card Game discussion. Want to start a club for the forums, or join already created one? This is the right place to gather and join forces for your likings and interests. If you are looking to challenge one of fellow members to a wi-fi pokemon battle, or need access to pokemon farm. Here we also will hold wi-fi tournaments! 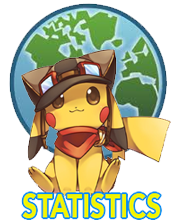 If you want to share your accomplishments in some of official pokemon games? Rules and Info regarding role-playing. Make sure to read everything here before the play. Here you can create a character, pokemon or an item to start your journey. Need something to help you in RPG? Here you will find markets, support, adoption center, events and anything you need in order to succeed. Explore good old Kanto, magnificent Johto, tropical Orange Islands, exciting Hoenn, magical Sinnoh, modern Unova or new Kalos region. Beat all gym leaders and elite 4 in order to become glorious champ. This is a forum based game where you can collect all pokemon. It's made on a farm concept where you collect and raise pokemon you get and display them to the public. A place to share with us your digital-art, paintings, sketches, designs, photography or just any other art you made or somebody else' art you like. Talented for writing stories, fan-fiction, memos, journal or any other writing and what to share it with us, please submit them here. A place to post your Role Play Games. It doesn't have to be about Pokémon, it can be anything you want! This is the place for anything relating to, well, anything - if it's a topic that doesn't fit anywhere else, it probably fits here! If you're a proud owner of some virtual pets that need care/clicking in order to grow and survive? Share them here. Have a fun forum game you want to play with others? Post it up! Want to participate in the other time-killers that have been posted? Have a ball! Want to Affiliate wit us? Post your request here and make sure to read the rules first. Old threads are located here.